ISO registered facilities ensure superior quality and consistency. Made from Formosa resins for reliability and consistency. Star-sealed bottom design distributes weight evenly—creates a seal up to eight times stronger than the film itself. Innovative “clamshell" box with E-Z identification code number system to eliminate confusion. Compact, coreless interleaved rolls are designed for effortless “one-at-a-time" bag dispensing. Much thinner than Linear Low Density (LLD) liners, but can hold the same or greater weight. Good tear resistance. Better puncture resistance and load capacity when compared to LLD liners. 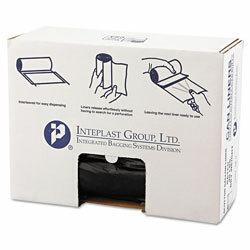 60 Gallons Black Commercial Can Liners from Inteplast Group! 543 In Stock today.